Amongst the dazzling display of roses, find the glowing fuchsia, an exotic-looking species with its terminal clusters of long, orange-red flowers. 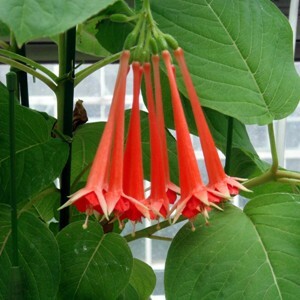 Its leaves are the largest of any in the genus, and it was the first long-flowered fuchsia to be brought to Europe, thanks to Theodor Hartweg in the 1830s. Naturally found distributed from Mexico-Costa Rica, it prefer a warm site in your garden. Its thickened, tuberous roots allow it to cope with dry conditions, and allow it to grow as both a terrestrial or epiphytic plant in the wild.